Finding prospects (leads) that are a great fit for your business can be an arduous and complex process. Sales isn’t always a linear, step by step process. A prospect can move forward, backward, off track and back on track again. There are times when someone will search out your business, know exactly what they need and you may be able to have sold that prospect within minutes. On the other hand, you might wind up with people dragging their feet and could possibly take them months to come to a decision. Creating a process where marketing and sales work together without any gaps can be tricky. But if done properly, you’ll have one of the most important irrigation business essentials. A process that saves time in the long haul while also capturing better leads and closing more sales. It’s well worth the effort of mapping your sales process. What happens when a lead comes in? What do you do after you send an estimate? How many times do you try to follow-up? It’s worth creating a communication rhythm for your sales reps. For example, if you use some sort of CRM, you can filter to find all of your estimates that you haven’t heard from that are more than a week old. Create a process to follow up - either by phone, email or social media - and make it part of the daily routine. Try different follow-up tactics and see which work best. Maybe a phone call won’t get your audience to act, but an email may. You should be compiling information throughout the entire sales process. From the first time a customer interacts with your business, you should be learning about them. What are their needs? What are their pain points? How did they hear about your business? Use the information which you’ve gleaned through each interaction in order to move them closer to the close. If you’ve provided your prospect with an estimate, ask questions like “does that sound good to you” or “do you have any questions about our process”. If you know your prices and can confidently speak to what your competitors are charging and whether or not they do quality work, use it to your advantage. Leverage your experience, provide the prospect with enough information where they’re comfortable with making a decision. Average Days to Close: Average days to close is another great metric that can help you fine-tune your sales forecast. It’s basically a measurement of how long it takes from the creation of a prospect to a decision. So if you create a prospect on June 1 and they tell you they’ve selected you on June 15, it took 15 days. Average Deal Size: A final metric to look at is your average deal size. Again, this is a simple number to calculate. Simply add up the dollar value of all the estimates you’ve won and divide by the number of estimates you’ve won. That gives you your average deal size. Why is that important? Again, it’s a great number to know for forecasting. But it’s also a good way to compare sales reps. You may have one that closes a lot of deals, but they’re all small. That tells you more sophisticated buyers may be turned off by that sales rep. Closing a lot of estimates isn’t necessarily the sign of a good sales rep. Closing a lot of revenue is. Passive lead generation is more and more of a focus for modern companies. It can come in a few different forms, but much of the passive lead generation that we do today is done digitally. Websites, social media, SEO and other forms of online marketing can all become passive lead generation tools. Let’s look at how some of your digital outlets can generate leads for you, without having to put in the physical leg work. Squarespace: a personal favorite of mine. They have the most minimalistic and beautiful templates out there. Plus, these templates are responsive, displaying your website’s beauty and intuitive design on any device, from desktop, to tablet to mobile. If you want a professional looking website, I’d definitely give Squarespace a good hard look. Wix: With over 500 templates available, Wiz makes creating a great looking website quick and easy. Their drag and drop builder makes adding content to your site a mouse click away. Weebly: If you’re not looking for any frills, Weebly is a solid choice. They’re drag-and-drop editor is probably the easiest out there. Search Engine Optimization is the process of creating and maintaining a great web presence so that when consumers are searching for your product or service, they find you. SEO is no longer a concept that is limited to webmasters and digital agencies, but to everyone with a website. When you create your website, what terms are you using in the content that would result in a search engine to rank you in searches? When you update your website, what content is going to get you found by customers in your area? And are they able to interact with your site on any device? Research: The first step in developing a local SEO strategy is to determine where you currently stand and how you stack up against your competitors. To figure that out, start listing out all the possible long tail keywords for your area. So you can combine the services you provide and the territory you work in. Target: Once you’ve identified a larger list of keywords that could be a good fit for your customer base, start whittling them down to your top ten based on how much traffic they’ll bring to your site. When you have that keyword identified, you can then create targeted content around it. 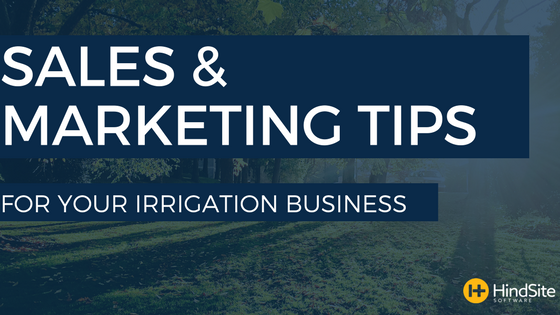 You could create a webpage that talks about irrigation services in your area, or a testimonial page from customers or create content, like a blog post or video, about local water management goals for insert your city here. While social media can take time to set up and maintain, it can also be a passive lead generator. Why? Because many of the platforms allow for businesses to set up pages and profiles with complete business information and easy contact options, so people using those social media outlets can easily call, chat or email you about your services. Research: Before you get online, make sure you’ve done your research. By knowing your audience, you’ll know who will be viewing and engaging with your social media sites. Get to know the people that will be accessing your content, make it useful and entertaining for their specific interests. By knowing this information, it will be much easier to cater to their preferences. Quality Content: Quality content means it provides some sort of benefit for your audience when they read it. You’ll likely have to do some research to understand what this content looks like. If you have the means, try to integrate other media for your content. Video, images and infographics are very frequently viewed and shared on social media, so don’t get stuck on only producing written content. Goal: If you don’t have a clear goal in mind, you will find yourself mindlessly posting and creating meaningless content. Pick a goal and then curate and produce content that will get you there quickest. Cross-Platform Strategy: Social media is not a one-and-done type of deal. In order to make the most of your content, you should be posting across multiple platforms. You should be using every social media site that makes sense for your brand. Using multiple platforms creates a wider net for your audience, but be careful not to get messy. Engage: The savviest entrepreneurs know that engaging with their social media followers is vital. If someone mentions you in a tweet or comment, whether positive or negative, be sure to respond in a timely and professional fashion. The easiest way to increase popularity across social media platforms is to be friendly, reach out and engage as many people as you can.